The ACIM OE APP is three applications in one. 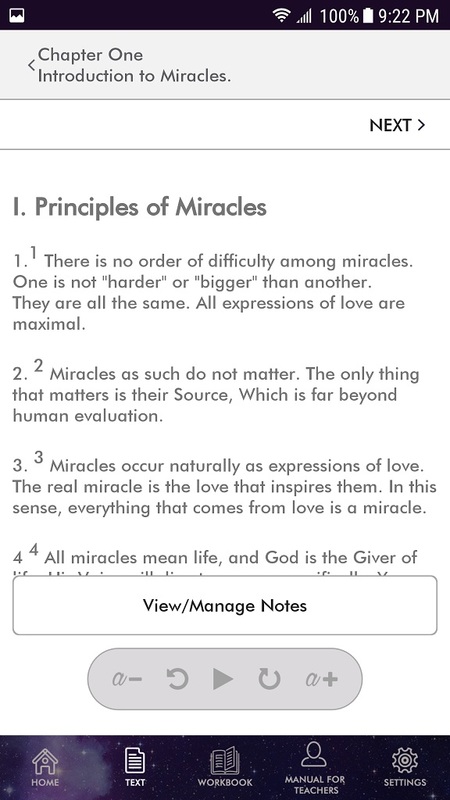 EBOOK: Read all three books of A Course in Miracles—TEXT, WORKBOOK, and MANUAL and take notes that are stored in the APP. AUDIOBOOK: Listen to the AUDIO of all three books read by Martin Caspers and accompanied by his inspired music. Just click the PLAY Triangle at the bottom of the page you want to listen to. SET A REMINDER: Write or Record an Affirmation for any Lesson in your own voice and set as a Reminder. There is also a SEARCH function, offering a robust search engine that will find a word or phrase anywhere in all three books. Now take A Course in Miracles with you wherever you go — to READ and/or LISTEN to the entire book on any of your devices, as well as set a REMINDER. NOTE: When a REMINDER arrives on your phone, “Notifications” must be enabled for the APP and your Notification Volume and Media Volume must be turned ON and UP. 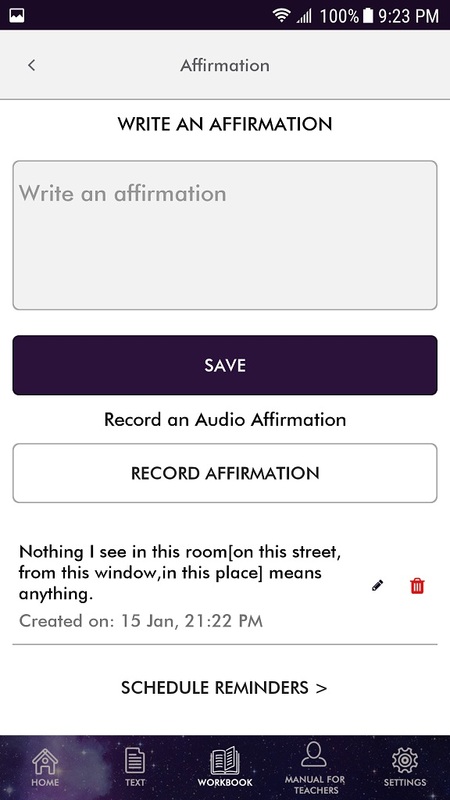 Click the Notification that arrives at the top of your Phone, and the APP will open to the AFFIRMATION LIST page where you can PLAY your Recording or READ your written Affirmation. 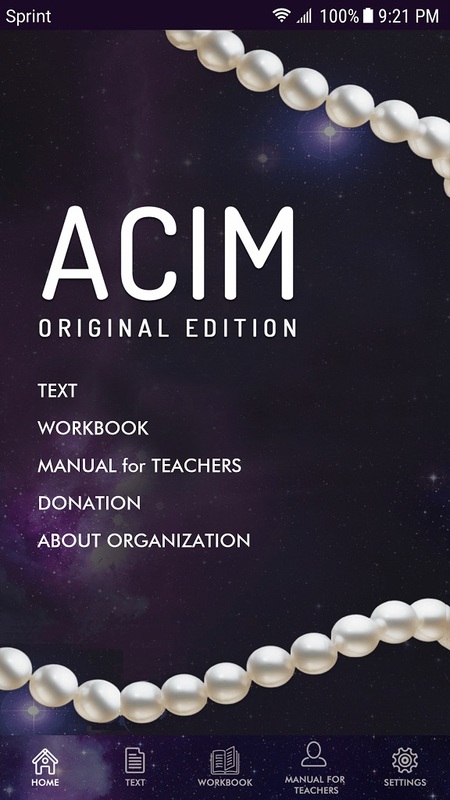 This ACIM OE APP is the A Course in Miracles – Original Edition: TEXT, WORKBOOK, and MANUAL for TEACHERS. The student can READ the Course, LISTEN to the Audio, and write NOTES in all three books. The student can also WRITE and/or RECORD an AFFIRMATION for any Lesson, which can then be scheduled as a REMINDER. There is also a SEARCH function in SETTINGS. 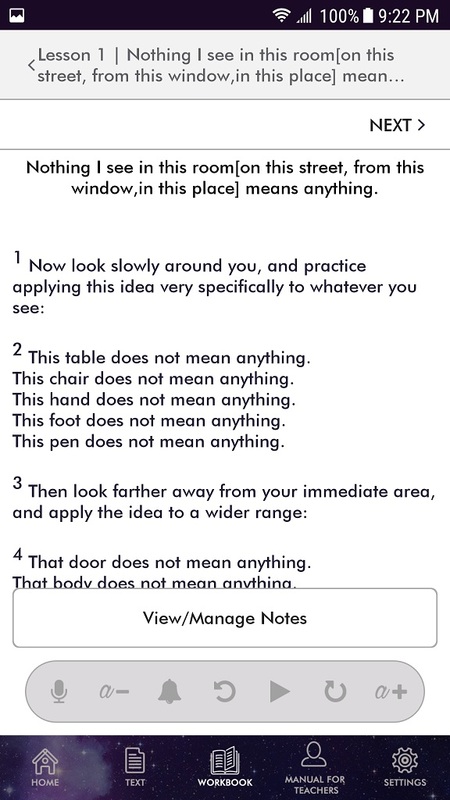 The ACIM OE APP lets you take Notes as you read. Here is how. Touch the View/Manage Notes button near the bottom of the screen. Press in “Add Note Title” area and choose the Title from the CLIPBOARD. Or, if you do not want to Copy and Paste, just write your own Title and Note in the Title and description area. A list of your Notes appears below the SAVE button. 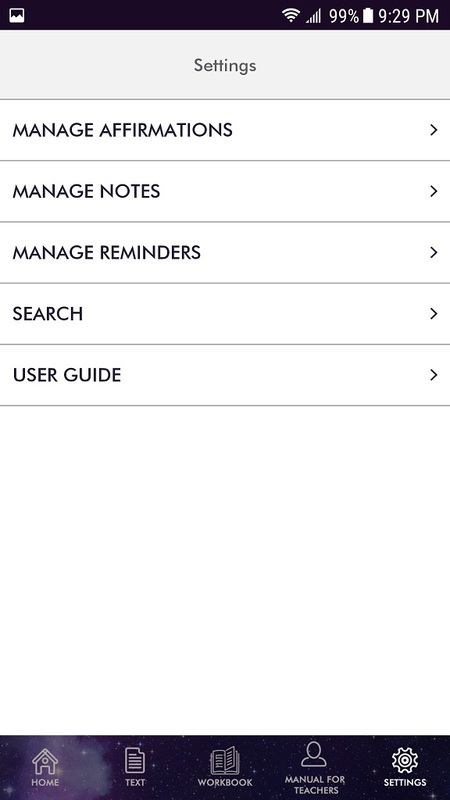 You can view, edit, or delete individual Notes with the icons to the right of the list. Many ACIM Lessons ask you to repeat your practice more than once a day. 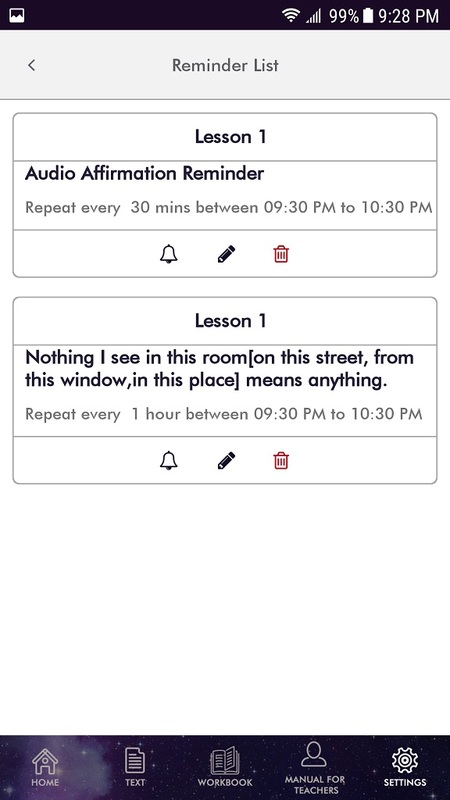 The ACIM OE APP lets you create reminders to repeat on a schedule you customize. 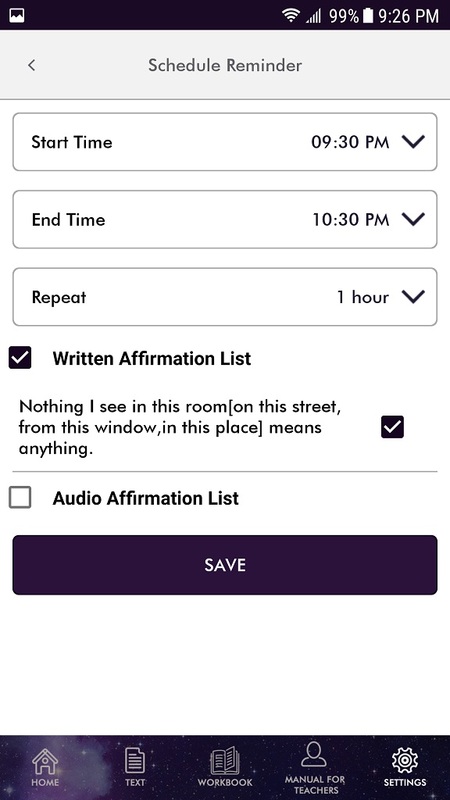 This feature can be used to send written reminders/affirmations to your phone’s home screen, or to play audio reminders/affirmations that you record in your own voice. Here is how. Touch the microphone icon at the bottom left of the screen. A list of your Affirmations appears below the SAVE button. You can update or delete the individual Affirmations with the icons to the right of the list. If you UPDATE the wording of the Affirmation after it has been Scheduled, you must delete the Reminder and Re-Schedule. To record an audio reminder while in a Lesson, touch the microphone icon at the bottom left of the screen. 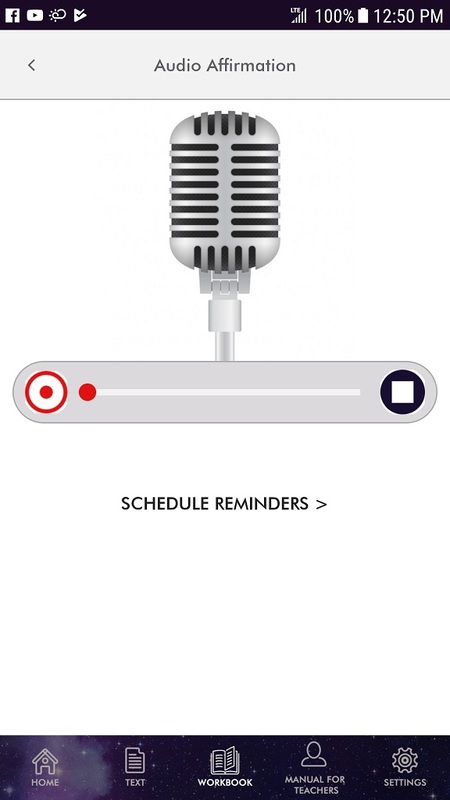 When the microphone appears, touch the RED Start button, and dictate your Reminder. Press the BLACK stop button to end the recording. Your recording appears at the bottom of the screen along with any others you may have made. You can Play or Delete the Affirmation Recordings with icons to the right of the list. Affirmations can only be scheduled within the same day. Once the time on your device passes midnight, you can schedule the Affirmations for that new day, but not before. Press down-arrow for Stop Time and do the same as above. Choose which Affirmation will follow this schedule by clicking the box next to Written Affirmation List or Audio Affirmation List and choosing which one in the list. Press the Pencil icon to Update the Reminder Start and Stop and Repeat times. There is also a SEARCH Function which will take you to the Course in Miracles Society [CIMS] website http://jcim.net to search the On-Line Edition of the Course. The search results are better viewed via Landscape. The screen can also be enlarged via the touch screen. The Donation page shows a PayPal Button although you do not have to have PayPal Account. You can use any Debit or Credit card to make your Tax-Deductible Donation. Course in Miracles Society has been blessed to have worked with INFOICON TECHNOLOGIES for the development of this APPLICATION. We are very grateful for all their challenging work, expertise, and dedication to this project.